Using Pinterest, and using it well, can be a time-consuming endeavor. But it’s time well spent because of the part it plays in well-rounded social strategies. In particular, Pinterest enhances the social clout and influence of businesses that offer consumer goods, clothing, beauty products, or services such as photography and event planning. According to Wayfair, shoppers referred by Pinterest are 10% more likely to make a purchase than visitors from other social networks. That’s a statistic that shouldn’t be ignored. Fortunately, automation has made social media marketing a lot easier. 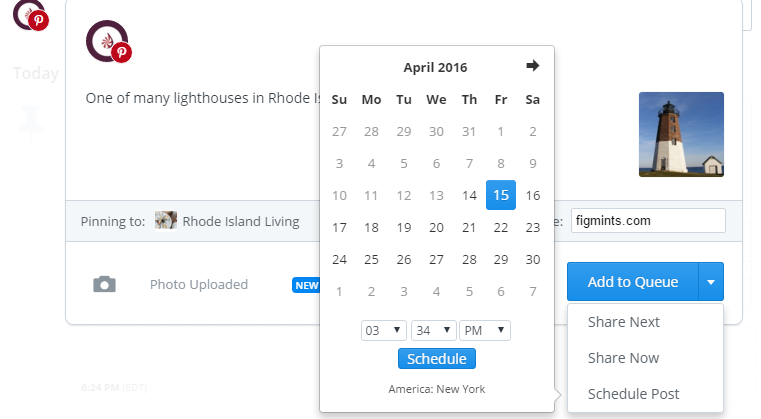 A lot of time and money can be saved by using a content calendar and scheduling tools. While we prefer HubSpot for most of our social media scheduling, there is currently no option for scheduling pins, so we did the research and tested three of the most popular Pinterest scheduling tools — so you don’t have to! SocialPilot is a tool that offers social scheduling for Pinterest and other popular networks like Facebook, Twitter, and LinkedIn. Unlike most tools on the market, SocialPilot supports even more networks including Tumblr, Xing, and VK. The biggest drawback I found is that each individual Pinterest board is counted as one account and you are only permitted to use up to three. 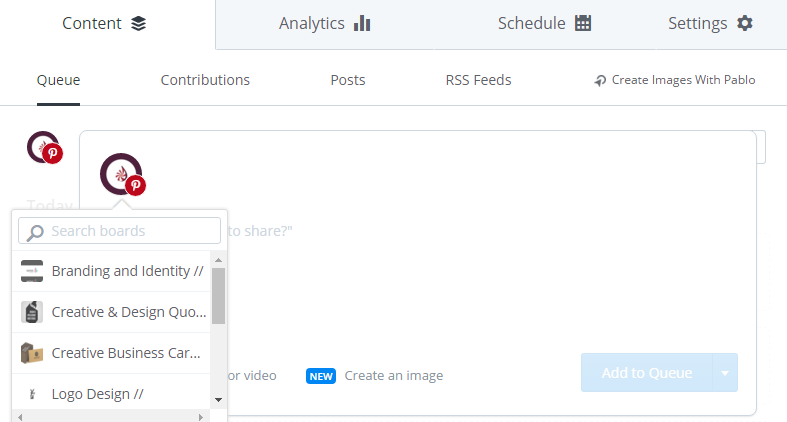 Not being able to add links into pins through SocialPilot is also a negative. Overall, it has what you need to schedule out some pins, but doesn’t exceed expectations. Step 1: Link the boards you wish to post to. 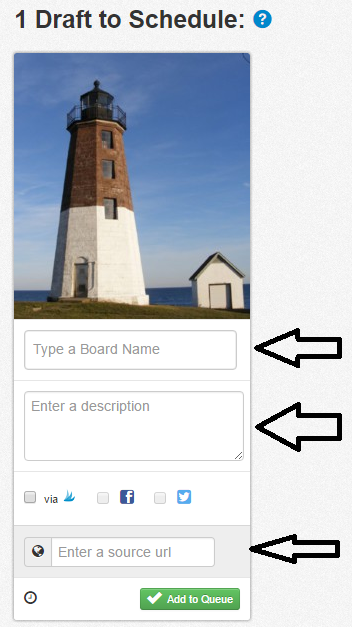 Step 2: Create a post and then select which board you want to post to. Step 3: Type out the description of the pin and attach the picture you’d like to pin. 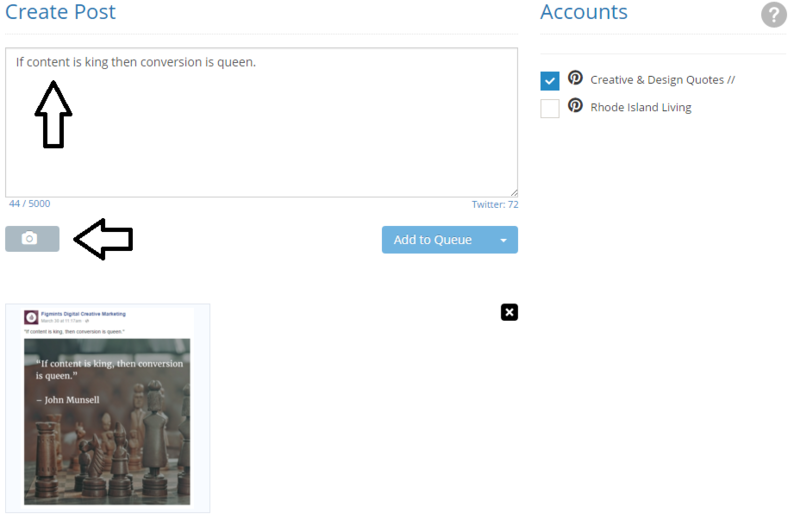 Step 4: Click the drop down arrow on “Add to Queue” and choose to post the pin now or schedule it out for a future day. 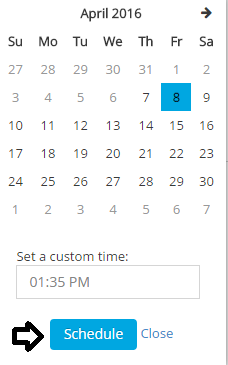 Step 5: When scheduling a future post, choose the date, and enter what time of the day you wish to have the pin posted and hit schedule. Tailwind is a great service. Rather than being time based, the trial version is free up to 100 pins. Optimized times are included for each day of the week, based on when you should be posting your content. They offer the option to design pins on their site and the option to pin things straight from Instagram. Tailwind also gives you ways to optimize content and track performance. Overall, it’s a great and easy to use tool. The basic plan would definitely be worth it for those that favor Pinterest. Step 1: First, log in and link your Pinterest account. 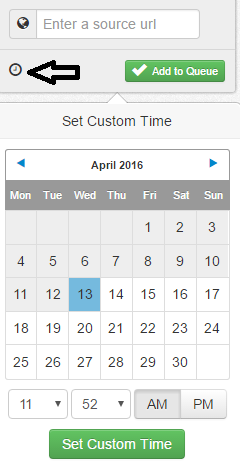 Then click on the “Publish” tab located on the left side of the screen and select scheduled pins. 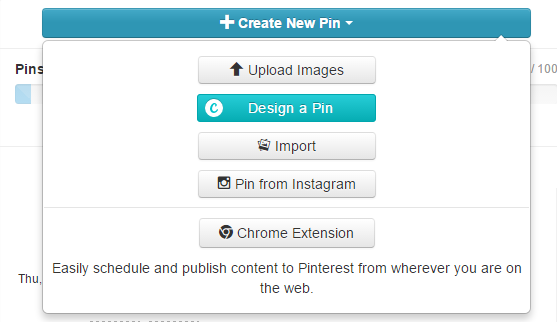 Step 2: In the top right hand corner, click create new pin. Step 3: Select the option you want to choose. I typically chose “Upload Images,” to submit content created by our designers using other tools. Step 4: Select the photo or image you wish to pin. Choose what board you want to pin it to then enter a description and a website link. Step 5: Click the tiny clock to the left of the green “Add to Queue” button and select the day and time you wish you have the pin posted. Figmints has used Buffer in the past, so familiarity was a helpful factor in choosing to use it for scheduling pins. Buffer is a very straightforward tool that offers free weekly and monthly trials. The trial I tested was for the “Awesome” plan. Like other options, Buffer also has suggested times that you should post at. Buffer is not primarily a Pinterest tool and has integration with a handful of other social networks. If a client needs other platforms included then Buffer is perfect. However, if you’re using Buffer for only Pinterest, $9.99 is is a reasonable price. Step 1: Click the plus button next to accounts then connect your Pinterest profile. Step 2: Click on the box to post in and a drop down menu will appear. Select the board you wish to post to. 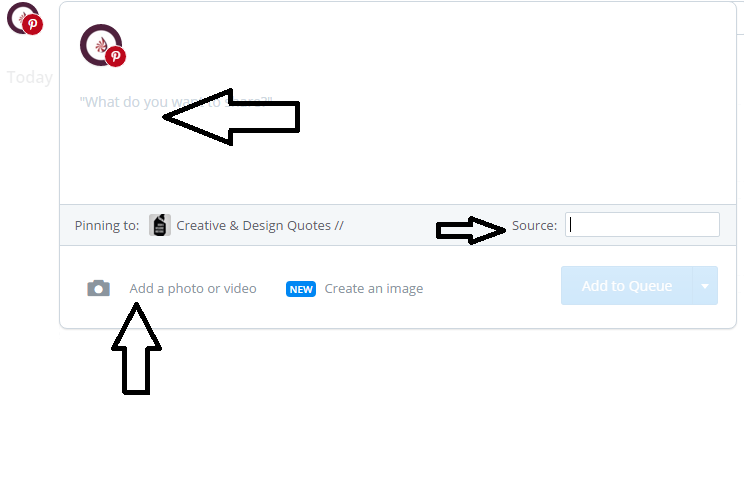 Step 3: Type out your description to the pin, attach the picture and add a URL to the source. 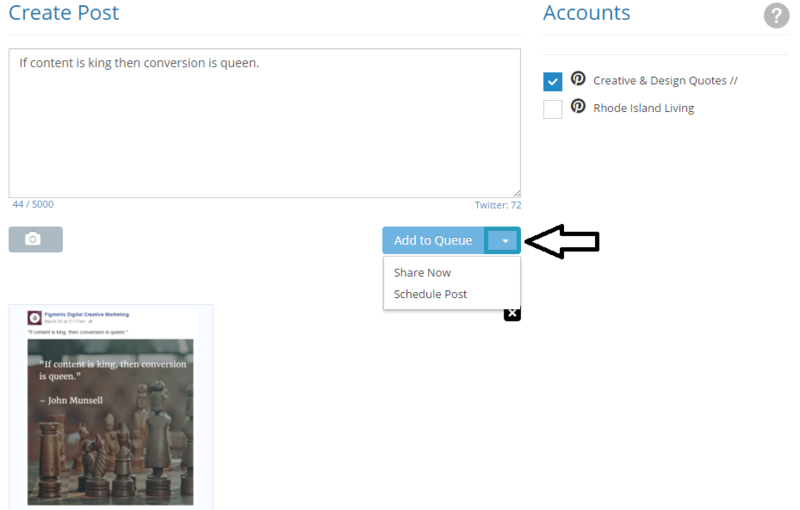 Step 4: Click the drop down arrow next to “Add to Queue,” and either post the pin now, hit “Share Next” to schedule it into the next suggested slot, or choose to manually schedule the post. Ultimately, I would recommend Tailwind as the best Pinterest scheduling tool. While Buffer is a great tool for those who are already using the service for their other platforms, I would recommend Tailwind for anyone with a strong customer-base on Pinterest. The price of their service rivals Buffer, but offers more options and analytics. Want to know more about how to use pinterest effectively? Drop blog topics you’d like us to cover in the comments section.